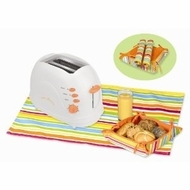 700 Watt Cool-touch toaster with free table mats and bread basket. Operates in three functions, cancel / defrost / reheat . Variable browning control. Slide-out crumb tray for easy cleaning, high lift for smaller bread pieces. Includes 2 free breakfast mats and 1 bread basket .